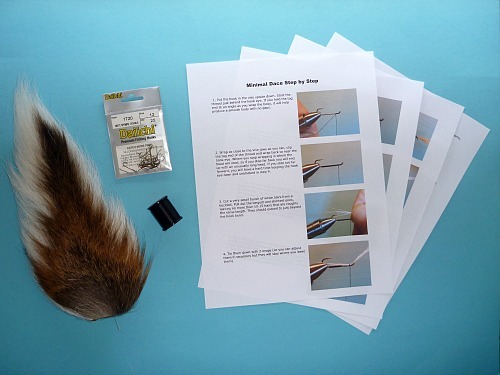 The "One Fly" Tying Kit™ Minimal Dace includes materials to tie 25 Minimal Dace bucktails and fully illustrated step-by-step instructions. With additional hooks, you will be able to tie many more than just 25 flies. The flies are tied sparsely, so one bucktail should be enough for hundreds of flies. The Minimal Dace pattern is the result of two things coming together: a continuing attempt to simplify the flies we fish and the TenkaraBum Streamer Challenge, which sought to increase awareness that a tenkara or keiryu rod, or even a seiryu rod, can fish a streamer or bucktail very effectively. One of the flies that worked well for me in the first month of the TenkaraBum Streamer Challenge was what I came to call the Minimal Dace. It is an extremely simple blacknose dace pattern - one that is easier to tie and uses fewer materials (and more readily available materials) than the well known Blacknose Dace bucktail created by Art Flick. The Minimal Dace requires only a bucktail and a spool of black thread. I do not presume to claim it is a better pattern, only that it is very simple and very effective. 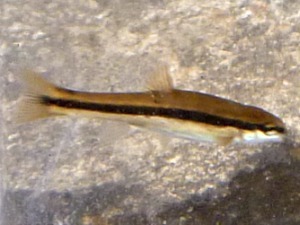 The blacknose dace is common in many trout streams. It is characterized by an an extremely distinct black stripe running down the side. The stripe is so black and so sharply delineated that it is hard to mimic with hair, whether the black bear hair Art Flick used or the black dyed bucktail that is more readily available. It is reasonably easy to copy with black thread wound on the hook shank, though. For anglers who have always struggled trying to get a drag free drift, this fly will make your life easier and your days on the stream more productive. Flies don't move much but minnows do. The same drag that screams to a trout that the fly is fake screams to the same trout that the minnow is getting away! Trout will chase the Minimal Dace and strikes are not subtle. Tenkara does give you the ability to minimize drag, but for some anglers there is still enough to compromise their presentation. When fishing a bucktail, they needn't worry. There has been some discussion in tenkara circles about what kind of rod you need to fish streamers. The fly you'll tie with this kit is relatively small (size 12) and quite sparse. You would be able to fish it with just about any fixed line rod. I am sure the Suntech HM30R could cast it easily and fish it effectively. The only concern is that you might very well hook a fish much larger than you expect. I have fished the Minimal Dace prototypes and the Minimal Dace itself a while now now, and have already caught one of the largest trout of my life. I couldn't get a photo because it was too big to fit in the net. When I reached for my camera it made one mighty flip and was gone. I recently had a surprising day on the stream. I was fishing a light jig with an ultra light spinning rod rather than a bucktail with a tenkara rod, but I am pretty sure the lesson is transferable. I almost always fish upstream. That day I fished the jig either across and down or even straight downstream and using a pulsed retrieve not unlike the way the Japanese masters pulse a sakasa kebari. The trout attacked the jig. I have to think that a pulsed bucktail, retrieved upstream through eddies and along current seams will do as well. Because of US Government regulations, I cannot ship the Minimal Dace tying kit out of the country. Domestic shipping is $4 via USPS First Class Mail. Just wanted to share that last year all my fish caught on the minimal dace were via manipulation...so I can confirm it works!